Here's part of our collection, me and my girlfriend started collecting these a couple years back. This is the collection at her place, I've got some more at mine that I'll show when I get back. 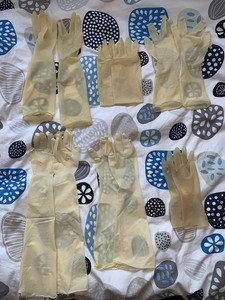 Her favourites are the fetish latex gloves, currently trying to find some more for her valentines gift. Pretty enviable relationship you got there. 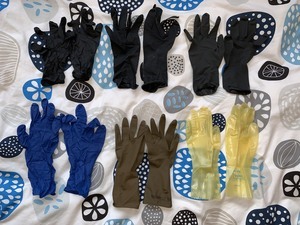 Gloves for Valentine's day, that's the best reason to celebrate that day I've ever heard. Yes, she loves the elbow length black pairs the most. if i were u i would go out and find a ring,u'v got a special lady there! That is an great collection. 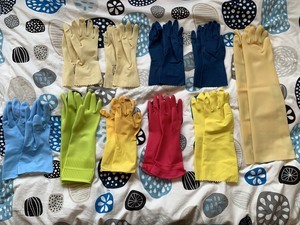 From which brand are the red latex gloves? u'v got more material's? satin\leather\pvc .. ? Hey sorry for the super late reply, been busy. No sorry, we do have leather gloves but they’re more for just wearing on super cold days and aren’t part of the collection. Guess we’re just specifically into rubber/latex sorry!